A new study shows trust decisions can be automatically triggered by the slightest glance. What's an advisor to do? It used to be cliché to say that the first 60 seconds of a meeting results in an enduring judgment about a person’s character — a view reinforced by the aphorism attributed to Will Rogers that you never get a second chance to make a first impression. But new research published in the Journal of Neuroscience suggests that early estimate may be more than a 1,000 times too long. The research suggests that the human brain develops an assessment about trustworthiness in a mere 50-millisecond exposure — indeed before even consciously perceiving a person’s face. Indeed, the study found that inferences of trustworthiness were highly correlated among multiple perceivers, “indicating that facial cues provide reliable signals about another’s underlying disposition,” the study finds. Perceptions about trust stem from a subcortal region of the brain called the amygdala, and while previous studies have shown the amygdala automatically codes trustworthiness when perceiving faces, what is new about the current study is that such automatic judgments are formed even in the absence of a full focus on the face — in other words, a mere glance is sufficient. Simple visual cues, such as enlarged white eyes, may trigger a fearful response. That trigger reaction may have evolved as a means of survival by motivating “appropriate behavioral responses” in reaction to an “evaluation of another’s likelihood to harm or help,” the study says. Specifically, lower inner brows and shallower cheekbones may signal untrustworthiness, whereas higher inner brows and pronounced cheekbones are cues of trustworthiness, according to New York University professor Jonathan Freeman, one of the study’s authors, reached by ThinkAdvisor. So what can financial advisors — who cannot do anything about the faces they were born with — do to enhance perceptions of trust among clients and prospective clients? 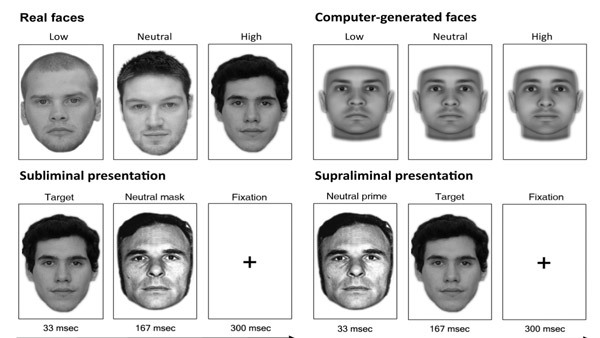 “Some research suggests faces appearing more trustworthy structurally resemble a happy expression and faces appearing more untrustworthy structurally resemble an angry expression,” Freeman says. And while a face does not change dramatically over a lifespan, some evidence indicates it is malleable, he adds, indicating that a person can work on himself to trigger greater trust. “For example, chronic displays of anger could, in theory, lead the face to become angrier at baseline, which in turn may influence automatic, initial responses to the trustworthiness of the face. In that case, the face may be seen as more untrustworthy,” Freeman says. In contrast, “smiling and displays of joy can convey openness to interaction, which could potentially convey more trust, so long as they are genuine and not forced smiles,” he adds. But beyond the theoretical potential benefits of that sort of active conditioning, the bottom line may be, as Freud put it, that anatomy is destiny. “First impressions are highly consequential and difficult to alter, and so one implication of our results is that this initial and automatic response to trustworthiness may be quite important for later social interactions in the real world,” Freeman concludes. Despite this biological determinism, the realities of how business is done today may provide an out for financial advisors cursed to look like used-car salesmen. That thought stems from a survey by advisor-vetting site Paladin Registry on how investors find advisors. Forget the 50 milliseconds. These days investors check out their advisor before they even get that subliminal glimpse — through the trust they impute via their friends and already trusted professionals (e.g. their CPAs) and through their Internet due diligence. The Paladin survey of 386 investors found that 75% of respondents used the Internet to research their advisors anonymously. What’s more, the survey shows, about half investors determined advisor trustworthiness sight unseen — through the Internet (23.9%); testimonials of other professionals (8.8%); references (7.7%); and Finra BrokerCheck (4.9%). The key factors in finding an advisor were referrals from family, friends and associates (39.5%); the Internet (25.3%); and referrals from CPAs or attorneys (13.4%). On another trust-related measure, Paladin asked if investors had a preference for large Wall Street firms or not. Respondents, all users of Paladin’s registry, expressed a strong aversion to the big firms — 69%, compared with the 16% that favored them. Check out Winning New Clients by Building Trust in the Initial Prospect Meeting on ThinkAdvisor.